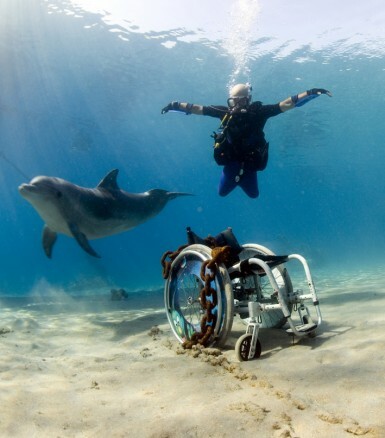 Disabled Divers International (DDI) is a not-for-profit organization, with the aim to promote, develop and conduct disabled scuba diving training programs for professional and non-professional students. All board members are volunteers, dedicated to promoting and developing disabled scuba diving internationally. Texas Dive Center, Inc. of Lubbock is one of just three DDI Training Centers in the United States. Since its introduction in 2010, DDI has gathered extensive support and recognition within the diving industry and conducted both professional and non-professional programs all around the world. DDI professionals and DDI dive centers can now be found in 58 countries with more on the way, enabling disabled diving world wide. As a diving professional the work with disabled divers is also rewarding as the students share their excitement and joy of their experiences. For diving professionals and dive centers alike, offering DDI programs can both help them differentiate them self from their competitors, but also offer added value to their community and staff. Medical clearance. Assistant if required for your disability. John has been a DDI Instructor for five years and is 60% VA disabled himself.